Rami displayed musical talents at early ages. When he was seven years old, he began studying Arabic music with his father and started teaching himself to play the piano. Taking a keen interest in Western Classical music, Rami began writing his own music at the age of 12. Upon coming to Germany in 1997, Rami studied Classical Music theory and piano technique with Michael Leslie. Later on, he studied piano and conducting at the Berufsfachschule für Musik in Bad-Königshofen and then studies film composition at the Film Academy Baden Wuerttemberg / Germany, where he graduated in 2008. After his travel to Jordan, he was working on his Ph.D, where he finished his Dissertation in 2014 (The Foundation of Harmonizing Arabic Music Scales Which Include Quarter-Tones (Rast Scale and Bayat Scale as models)). Among his publicized works “Sug Al-Safafir in Fall”, Sama’ai from Orient to Occedent, The tree of Arabic Music Scales, Marimba Solo, Fantasia Arabia, Penumbra and some other music composition for documentary films, motion pictures in addition to several short films. 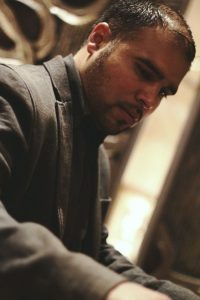 Meanwhile, Rami is composing music for films and working as a professor for Music and Multimedia Sound-Design in Doha. Baher’s performing career began in 1967, and his first television appearance was in 1968. In 1974, Baher became a member of the Iraqi Television Ensemble, which accompanied most of the prominent Iraqi singers of the time. He also performed regularly on his father’s television program “An Evening of Iraqi Maqam”. In 1974, Baher joined the Iraqi Traditional Ensemble, under the leadership of Munir Bashir. This group toured extensively throughout the Arab world and Europe. 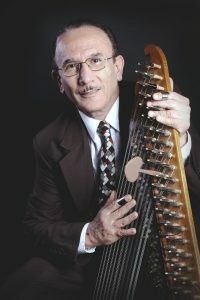 Baher has performed in many important festivals throughout the world, including the First Arabic Youth Music Festival (Algeria,1972), where he represented Iraq, performing solo Qanoun, the Viche Festival (France, 1973), the Rhine Festival (France, 1974) the Tustoor Festival (Tunisia, 1976), the Carthage Festival (Tunisia,1990), the Multi-Culti Festival (Germany, 2001-2003), and the Womad Festival (Australia, 2006). He has also performed extensively throughout the Arabian Gulf Countries, Europe, and the U.S.
His teaching career began in 1974, when he joined the faculty of the Institute of Musical Studies in Baghdad as a lecturing professor of Qanoun and Suntour, where he remained until 1985. In 1976, he began teaching Arabic Music Solfege and Muwashahat at the Institute of Fine Arts, where he remained until 1990. He also taught Qanoun at the School of Music and Ballet throughout the 1980s. As a scholar, Baher has made significant contributions to the study of Arabic music and Iraqi music. His book, “The Rules of Baghdadi Maqam Singing” (1985), includes the first transcription of Iraqi Maqam. In his forthcoming book “The Tree of Arabic Music Scales,” he sets out to clarify Arabic musical theory and present an integrated, comprehensive theory of Arabic scales and Maqamat. Baher is one of the most prolific living composers of Iraqi music, having composed 12 Sama’is, 5 Muwashahat, a Bashraf, a Longa, a Qasida, in addition to many songs in the traditional Baghdadi style, instrumental pieces, and children’s songs. He has also made alterations and arrangements of some of the traditional songs in the repertoire. Most importantly, Baher has composed two new Maqams, “Sharq Mu’ather” and “Zangola,” the first new Maqams to be added to the repertoire in approximately 75 years.